This post may seem a little awkward, coming a week after the American Thanksgiving but since I’m not American, nor based there and since there is no similar celebration over here in Malaysia, I just wanted to share some things for which I’m thankful, as November draws to a close and the year end becomes imminent. Sometimes, as we go around our daily lives, we may miss or forget the little things that make up our lives and to be thankful for small mercies. It needn’t be something earth shattering, or even something prominent. But I’ve found that sometimes just recounting the little things that are positives, makes big problems seem smaller and less significant. 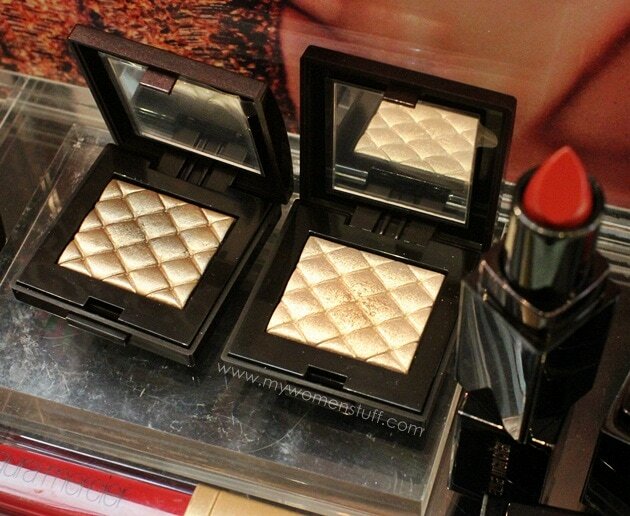 One of the quieter, more understated Winter/Christmas collections is the one from Laura Mercier. Amidst the glitz and sparkles of the larger cosmetics brands, Laura Mercier quietly enters the room bringing with her beautiful red lips and a touch of elegant metallic shine on eyelids, drawing inspiration from the Art Deco period in the 1920s. The collection is small, compact and incredibly alluring to me. How can anyone resist anything with a name like that! 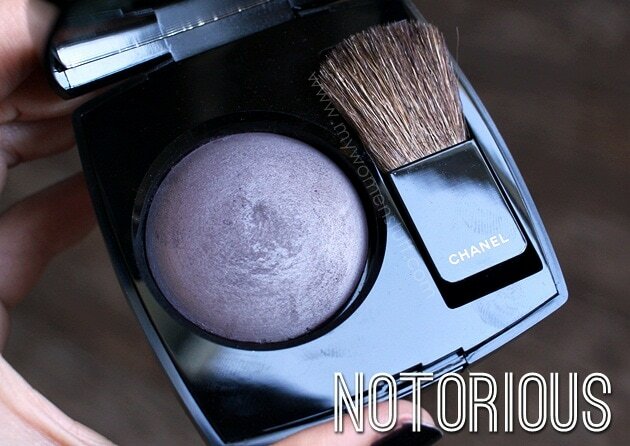 “That” in this case, is what Chanel calls a “Sculpting Veil for Eyes and Cheeks”. The idea is to use it to sculpt your features (a more elegant way of saying “contour”). I have seen many pictures of this online already and just like its name, the views on this product are notoriously divided. People either love it (“OMG! Cheekbones!”) or hate it (“OMG! Dirt on my face!”). I couldn’t quite decide. So I hoofed it down to the Chanel counter (Pavilion KL if anyone’s wondering. I’m not sure if its available at other Chanel counters), plonked myself down in the chair and told the SA to do her worst. Ok, her best. She was quite amused that I had requested to try this powder. My guess is most people take one look at the grey concrete looking dome and pick up the Christmas edition Stardust blush instead (so pretty! I was tempted but passed because it was too sparkly). So she seemed quite helpful in helping show me how I could wear it. I personally refuse to buy anything from Make Up For Ever locally, because the SAs at Sephora (where its sold) have, on the 2 occasions I’ve been interested to buy anything, been brusque, pushy and on a memorable occasion, refused to allow me to purchase a foundation I wanted, because to them, I should take one 2 shades darker and more yellow. I know, go figure. On the other hand, I regularly return to a certain Crabtree & Evelyn store to pick up Christmas goodies or any goodies, because the SA there is a lovely lady who is helpful and friendly no matter when I drop in. 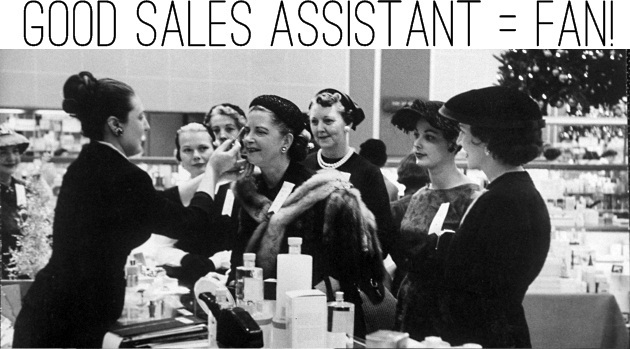 Its the sale industry, and like it or not, sales assistants are for many of us, the first point of contact with a brand. Have you experienced a situation where a poor experience with a sales assistant turns you off a particular brand? Or maybe you had a good experience and that keeps your interest in a brand?